The lower jaw of a 62 year old man without any teeth. Three implants are chosen to reduce the wear-and-tear on the implant inserts since the retentive forces will be spread over three implants instead of two. The lower jaw usually does not provide a good fit for a conventional full denture. This ridge, and its underlying bone, is somewhat thin. Three implants will be placed in the middle of the jaw -- were there is no nerve which could be damaged. The three implants appear as white on the x-ray. The small "ball" inserts can be seen on the top of the implants. The lower jaw bone is more of a gray color and surrounds the implants and extends below the implants for approximately 1/2 inch. This view of the patient's mouth shows how the implants appear when the overdenture (the name given to a denture which sits over these implants) has not been inserted over these implants by the patient. The patient can easily clean around these implants with a toothbrush.Various implant manufacturers may have different types of "heads" that go into the implants but the basics are the same. 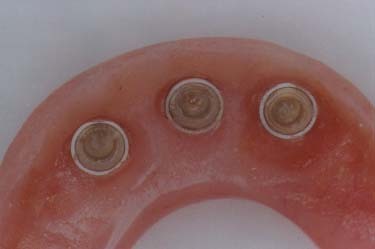 This shows the three "O - ring" attachment sites into which the implants will fit. When patients have had severe bone resorption from previously wearing a lower denture, a new denture or a ball-and socket supported implant overdenture which rests on the gums may "pinch" the nerve which rests on top of this severely resorbed ridge. The bar-retained overdenture is recommended since the overdenture rests on the bar, not the gum tissue. This 48 year old woman has had very sensitive gums under her denture. 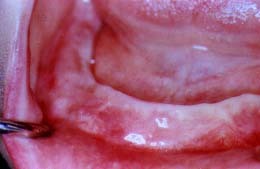 Her mouth is also "dry" since the medication that she takes reduces the amount of saliva in her mouth. This view of her lower jaw shows that her ridge is thin and "knife-edged". This, in combination with her dry mouth, has contributed to her inability to be satisfied with a normal lower denture. 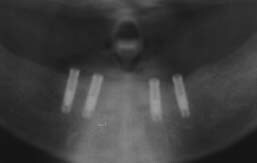 This x-ray shows that 4 implants have been placed as "pairs" on each side of the front of the of the lower jaw. This "pairing" of the implants leaves room for more retention on the bar in the front of the mouth, as well as back on the sides of the bar. However, there are also reasons in some cases to evenly space the implants instead of "pairing" them. 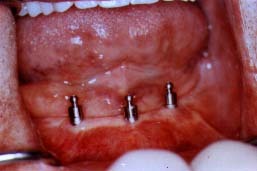 This view of her mouth shows how the bar is secured into the 4 implants by small screws. The bar will then serve to retain the overdentue since the overdenture has small "clips" on its underside. These clips will grasp the bar and provide a very satisfactory retention. A ball-and-socket retention can also be created on this type of a bar. 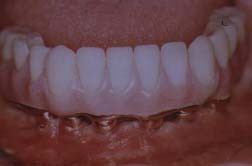 Small metal or plastic clips are imbedded into the denture. These clips will attach to the bar. Another option is the use of ball-and-socket type attachments. May need 4-8 implants depending on the amount and quality of the bone present. However, in most cases, 4 implants won't be adequate. An option for those patients who don't want anything removable in their mouth. The teeth are built upon a metal base through which screws are inserted and, in turn, secure the teeth into the implants. 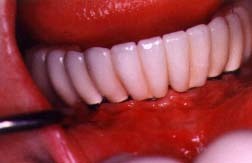 The metal base does not come into contact with the gums and sits, like a "platform" above the gums. 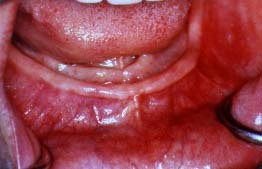 This "high water line" may be inconvenient for some cases, especially for upper teeth replacements. If this is a concern, the use of crowns, which go over the implants, may be a better, although more costly, option. This 62 year old male has worn upper and lower full dentures for 31 years. His lower denture is unsatisfactory and he doesn't want any removable implant replacement. The upper teeth are pleasing to him and will not need implant replacements. His lower ridge still has enough bone to allow for six implants to be placed between the nerves. 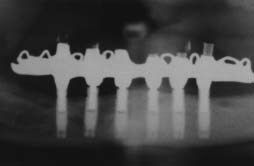 The x-ray shows the six implants as the vertical white screws. The metal base upon which the teeth are built is white and on the horizontal plane. This view shows the teeth and the pink plastic which looks like the gum tissue. 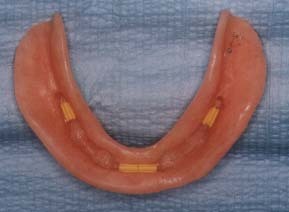 Under the"gums" are the gold "collars" which are connections to the implants which are under the gum tissue. 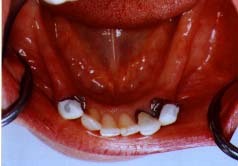 You can notice the space between the underside of the teeth and the patient's gum tissue. 4-10 implants may be needed. Four implants would not be adequate in most situations. Ten implants, or in some cases even more, may be used when the amount of bone only allows for very short implants. This type of reconstruction feels more natural to the patient since crowns are placed over the implants. These crowns then support replacement teeth which look and feel just like crowns. The patient's ability to clean around the crowns and implants is ideal when considering implant reconstructions in jaws which have no teeth. This 43 year old woman has never been happy with a full lower denture. She is very concerned with her appearance and wants her mouth to look as good as the rest of her. 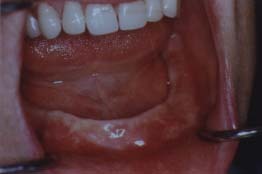 This view of her lower jaw shows a ridge which won't provide much retention for a lower denture. Most lower jaws with no teeth will not create any suction for a lower denture. She has significant bone loss in the back area of the jaw and implants can only be placed in the front of the jaw, between the nerves. 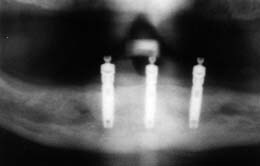 The x-ray shows that there are 6 implants which appear as the vertical screws. 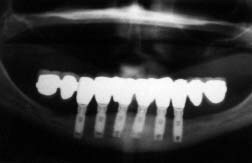 The crowns are built upon the implants and two crowns are extended horizontally from each side of the last implant. 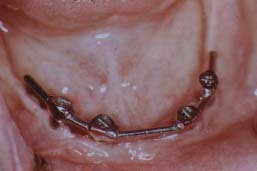 These extended crowns are supported.by being connected to the crowns which are cemented onto the implants. These extended crowns are called "cantilevered crowns". This view shows the actual crowns which have been built upon the implants. The appearance and form of the crowns not only look natural, but also allow for easy cleaning around the crowns and the implants. This type of case provides excellent satisfaction for the patient. 2. Where only some of the natural teeth are missing, implants can replace a removable partial denture. 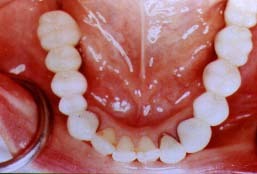 The determination as to what type of tooth replacement is to be used is made based on the number of teeth missing and from where in the jaw they are missing. Some missing teeth may be replaced without implants if there are strong teeth on both sides of the gap from which teeth are missing. However, if the gap is too long from too many teeth being missing, implants will be needed in order to provide additional support for the replacement teeth. If the missing teeth are at the back of the jaw and there are no teeth at the very back of the jaw upon which a bridge could be built, then implants are the only way that a fixed, non-removable replacement can be constructed. May be built upon implants only or in combination with implants and natural teeth providing the support required for the replacement teeth. Crowns are built upon the implants, and also on natural teeth if that is the desired treatment plan. 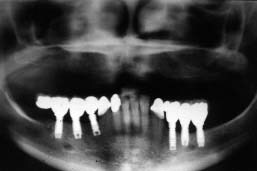 These crowns can be attached to the implants by being cemented or screwed into the implants. -- any crowns placed upon natural teeth would be cemented on. This 47 year old woman has lost most of the back teeth in her lower jaw. She wears a full upper denture with which she is not unhappy. However, she is unhappy with her lower partial denture which she had worn for 22 years. This view is of the lower jaw just as if we are looking directly down on the six remaining teeth. These are her front six teeth at the bottom of the picture. The missing back teeth would have been vertically above the front teeth as we view this picture. This will be clearer when you see the completed case and see where the replacement teeth go. This x-ray was taken after the crowns were built upon the implants. There were six implants used and these are seen as the six vertically projecting white screws going down from the white crowns. Due to the limited amount of bone present, these are shorter implants (5 are 10 mm. in length) than were seen on other x-rays in this site. This is the same view as you had on the "Pre-Treatment" view. You now can see that the missing back teeth have been replaced with crowns that were cemented onto the implants and natural teeth. These crowns could also have been secured to the implants with screws instead of being cemented. May be used to replace front teeth or back teeth. Due to the need for pleasing bone cosmetics in the front, the bone quantity and quality at the implant site must be good or bone grafting may need to be considered. This case is of a 16 year old female who has what are described as "congenitally missing lateral incisors". 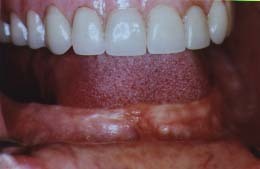 These patients are born with the tendency for their upper lateral incisors to not be present when the other permanent teeth erupt into the mouth. Prior to the availability of dental implants, these patients would either have orthodontic therapy which would move the cuspids into the space where the lateral incisors were not present. However, the cuspids would not always look as good as the patients and their families liked. This view shows the two central incisors and the spaces lateral to these teeth which is where the lateral incisors should have been. 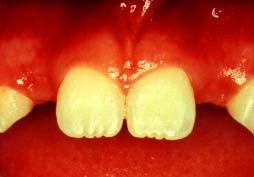 One can see a portion of each cuspid tooth which borders the back portion of the lateral incisor space. 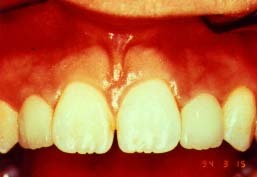 The amount of space where the lateral incisors should have been present is usually narrow. This makes the surgical implant placement more demanding. The x-ray on the left shows a space between the two teeth (the central incisor and the cuspid) which is where the lateral incisor would have normally been positioned. The x-ray in the middle shows the implant as a white screw which has been expertly placed between the cental incisor and the cuspid. The x-ray on the right shows the implant with the crown cemented upon it. This view of the same patient shows the two crowns which have been placed on each of the two implants which were surgically placed in the lateral incisor positions. The crowns look natural and have provided the patient with a very pleasing smile.